The shapes of supernova leftovers can tell scientists the origin of this explosion, with Type 1a supernova from thermonuclear explosions leaving behind symmetric remnants (right). And supernova created when a massive star collapses tend to leave behind asymmetrical remnants (left). Like thesmoke left in the sky after a round of fireworks, debris remaining in the wakeof a supernova could reveal exactly how that star exploded even though hundredsor thousands of years have passed. That's whatscientists have determined from images of such leftovers taken by NASA's ChandraX-ray Observatory. 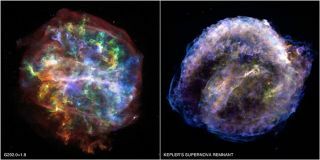 "It'salmost like the supernova remnants have a 'memory' of the original explosion,"said lead researcher Laura Lopez of the University of California at Santa Cruz. "This is the first time anyone has systematically compared the shape ofthese remnants in X-rays in this way." Astronomerssort supernovasinto categories based on properties in the optical spectrum within days of thestar exploding. Such properties label a supernova in two main ways: Type Ia, meaning the progenitor was a binary star system in which one star accumulatedmatter from its neighbor until a runaway nuclear reaction ignited; or a TypeII, which occurs when a very massive, young star collapses onto itself beforeexploding. Sinceobserved remnants of supernovas are leftovers from starexplosions that occurred long ago, other methods are needed to accuratelyclassify the original supernovas. "Inthe last 300 years we have not observed a supernova go off in the MilkyWay," Lopez told SPACE.com. "And so all of the ones we've observeddirectly in the last 30 or 50 years are in other galaxies. The ones we know inour galaxy are only from remnants." Lopez andher colleagues looked at supernova remnants in the Milky Way and a neighboringgalaxy, the Large Magellanic Cloud. Results showed that Type Ia supernovas leftbehind relatively symmetric, circular remnants, while debris from Type IIsupernovas was distinctly more asymmetric. When thestellar guts spew out into space, they also heat up the interstellar medium nearby,and so Lopez thinks the symmetry could tell astronomers something aboutthat medium. "Itseems that Type Ia supernovas probably go off in a very low-density medium that'svery homogenous whereas core-collapse supernovas probably go off in a verydense environment that is not uniform," Lopez said. One of theremnants, known as SNR 0548-70.4, was a bit of an oddball, the researchersfound. Based on its chemical abundances, SNR 0548-70.4 was considered a Type Iasupernova, but Lopez found it was asymmetric, suggesting a core-collapseremnant. "We dohave one mysterious object, but we think that is probably a Type Ia with anunusual orientation to our line of sight," Lopez said. "But we'lldefinitely be looking at that one again." Even thoughthey studied supernova in our galaxy and a neighbor, the researchers think thetechnique could be extended to remnants farther away. Theresearch was published in the Nov. 20 issue of The Astrophysical JournalLetters.